Henri de Toulouse-Lautrec was a French painter, printmaker, draughtsman and illustrator whose immersion in the colourful and theatrical life of Paris in the late 1800s yielded a collection of exciting, elegant and provocative images of the modern and sometimes decadent life of those times. Toulouse-Lautrec – along with Cézanne, Van Gogh and Gauguin – is among the most well-known painters of the Post-Impressionist period. Throughout his career, which spanned less than 20 years, Toulouse-Lautrec created 737 canvases, 275 watercolours, 363 prints and posters, 5,084 drawings, some ceramic and stained glass work, and an unknown number of lost works. He excelled at depicting people in their working environments, with the colour and movement of the gaudy night-life present but the glamour stripped away, and was masterful when painting crowd scenes in which the figures are highly individualized. At the time that they were painted, the individual figures in his larger paintings could be identified by silhouette alone, and the names of many of these characters have been recorded. Toulouse-Lautrec was born at the Hotel du Bosc in Albi, Tarn in the Midi-Pyrénées region of France, the firstborn child of Comte Alphonse de Toulouse-Lautrec-Monfa and Adèle Tapié de Celeyran. He was therefore a member of an aristocratic family. A younger brother was born on 28 August 1867, but died the following year. The family quickly realised that Henri’s talent lay in drawing and painting. A friend of his father, Rene Princeteau, visited sometimes to give informal lessons. Some of Henri’s early paintings are of horses, a speciality of Princeteau, and a subject Lautrec revisited in his ‘Circus Paintings’. Henri’s parents, the Comte and Comtesse, were first cousins and Henri suffered from congenital health conditions sometimes attributed to a family history of inbreeding. At the age of 13 Henri fractured his right thigh bone and, at 14, the left. The breaks did not heal properly. Modern physicians attribute this to an unknown genetic disorder, sometimes known as Toulouse-Lautrec Syndrome. His legs ceased to grow, so that as an adult he was extremely short. He had developed an adult-sized torso, while retaining his child-sized legs. Physically unable to participate in many activities typically enjoyed by men of his age, Toulouse-Lautrec immersed himself in art. He became an important Post-Impressionist painter, art nouveau illustrator, and lithographer, and recorded in his works many details of the late-19th-century bohemian lifestyle in Paris. Toulouse-Lautrec contributed a number of illustrations to the magazine Le Rire during the mid-1890s. 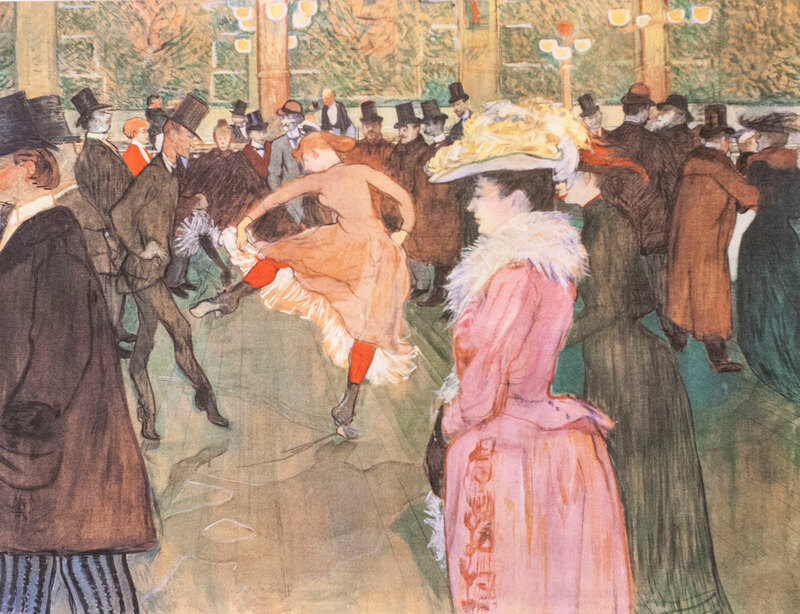 Toulouse-Lautrec was drawn to Montmartre, the area of Paris famous for its bohemian lifestyle and the haunt of artists, writers, and philosophers. Studying with Bonnat, and subsequently Fernand Cormon, placed Henri in the heart of Montmartre, an area he rarely left over the next 20 years. At this time he met Émile Bernard and Van Gogh. With his studies finished, in 1887 he participated in an exposition in Toulouse, and later exhibited in Paris with Van Gogh and Louis Anquetin. Vincent van Gogh’s brother, Theo bought ‘Poudre de Riz’ (Rice Powder) for 150 francs for the Goupil & Cie gallery. 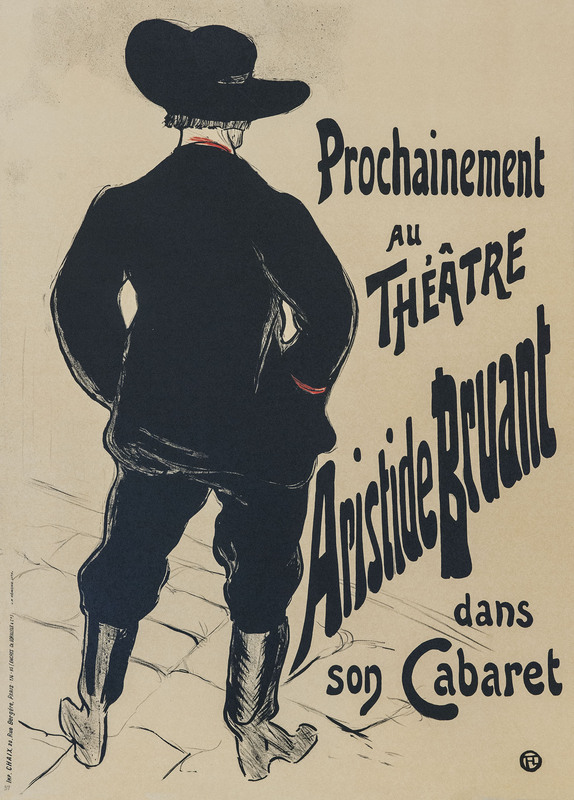 When the Moulin Rouge cabaret opened, Toulouse-Lautrec was commissioned to produce a series of posters. 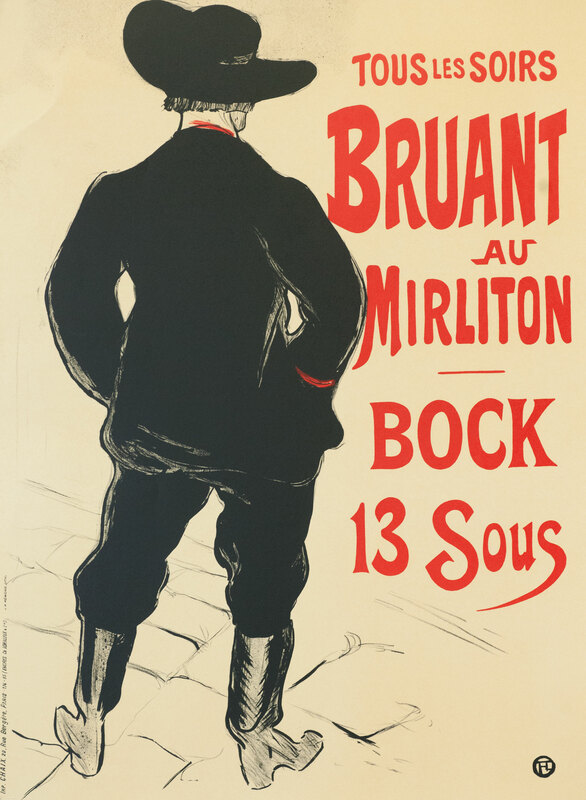 His mother had left Paris and, though Henri had a regular income from his family, making posters offered him a living of his own. The cabaret reserved a seat for him and displayed his paintings. Among the well-known works that he painted for the Moulin Rouge and other Parisian nightclubs are depictions of the singer Yvette Guilbert; the dancer Louise Weber, and the much more subtle dancer Jane Avril. Though not as fluent as he pretended to be, he spoke English well enough to travel to London. 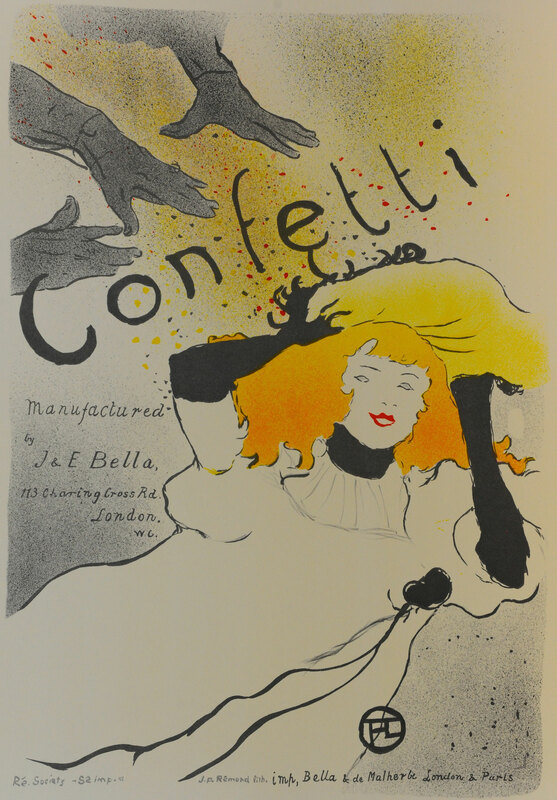 Making posters in London led him to making the ‘Confetti’ poster, and the bicycle advert ‘La Chaîne Simpson’. Lautrec was mocked for his short stature and physical appearance, which led him to drown his sorrows in alcohol. He was one of the notable Parisians who enjoyed American-style cocktails, France being a nation of wine purists. He had parties at his house on Friday nights and forced his guests to try them. The invention of the cocktail “Earthquake” or Tremblement de Terre is attributed to Toulouse-Lautrec. This content is a derivative of: Wikipedia contributors. “Henri de Toulouse-Lautrec.” Wikipedia, The Free Encyclopedia. Wikipedia, The Free Encyclopedia, 6 Sep. 2014. Web. 5 Oct. 2014.